For Madrileños, there is nothing like a nice cold lager Mahou Spanish beer served with some of the best Spanish tapas in Madrid. At Native Spanish tapas we share this amazing combination in one of our many Madrid Tapas tours. Mahou beer is slowly getting the recognition it deserves around the world. 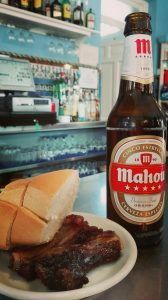 Some of our customers sometimes ask us at the beginning of one of our many Madrid tapas tours if they are going to drink a Mahou during our Madrid tapa crawl, and the answer is “claro que sí”, “of course so”. Today, we are going to have a brief look into the history of this delicious Mahou Spanish beer. The history of Mahou dates back to the end of the 19th century, when Frenchman Casimiro Mahou arrived to Madrid and set up a paper factory among other small businesses. After his death in 1875, his widow and children embarked on a totally new business: beer making. Not only did they brew beer but they also sold ice, a big commodity back then. You can visit the original building on calle Amaniel in Madrid. The success of Mahou was almost instantaneous; it took only three years for Spanish people to identity Mahou beer with Madrid, as it was slowing starting to sell throughout the rest of Spain. A pivotal date in Mahou’s history was in 1922, when it substituted the cork bottling system to the bottle-cap bottling system. From then on, the company started growing exponentially, and in 1957, Mahou became a public limited company. In 1962, Mahou opened up a factory in the heart of Madrid employing over 1500 workers and brewing more than 5 million liters of beer a day. In 2007 Mahou created a partnership with globally strong San Miguel beer, and to this day, has continued brewing one of the best beers that go along with some of the best Spanish tapas in Madrid. Visit us on one of our many Madrid tapas tours with Native Spanish tapas.